Clinical Pilates focuses attention on core postural muscles that keep the human body balanced and provide support for the spine. In particular, Pilates exercises teach awareness of breath and of alignment of the spine and strengthen the deep torso and abdominal muscles. By awakening these muscles the rest of the body is able to gain strength and will correct posture and movement patterns without causing injuries. Classes at Total Balance Physiotherapy are limited to 4 clients and are ran by our qualified physiotherapists so that you receive the appropriate level of input, guidance, feedback, and education required to achieve your goals. The Pilates studio at Total Balance includes 4 reformer beds, a trapeze table and a range of floor/mat equipment. 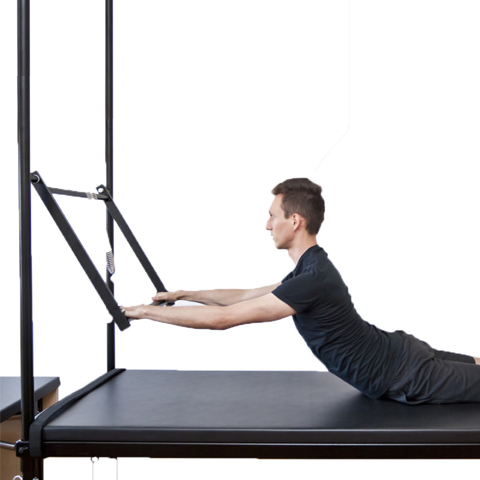 Clinical Pilates is a form of treatment that is suitable for a range of clients including athletes, elderly, young mothers and in general anyone who wants to retain their strength, mobility, endurance and flexibility. It is also an excellent form of rehabilitation for injuries and surgical procedures.